With its system volume optimized, the i-Series significantly reduces the work needed to transfer methods developed on non-Shimadzu systems or previous Shimadzu LC-2010 systems. This helps ensure a smooth launch process after a new installation. 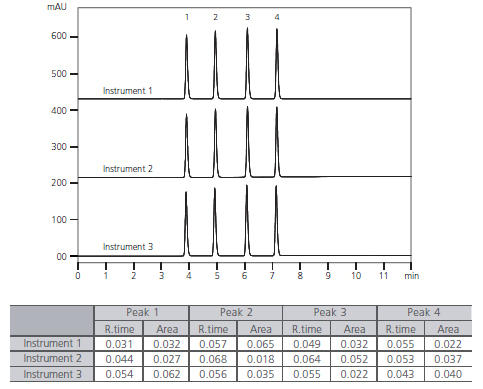 In addition to its reproducible performance on a single system, the i-Series' excellent system-to-system reproducibility further improves data reliability. With its unsurpassed performance in areas such as solvent delivery precision, concentration accuracy, and injection volume accuracy, the i-Series is now a new industry standard for global labs. A low-volume, high-efficiency mixer and optimized system volume support high-speed applications of existing methods. Furthermore, the pressure resistance of Nexera-i enables both high speed and high separation. 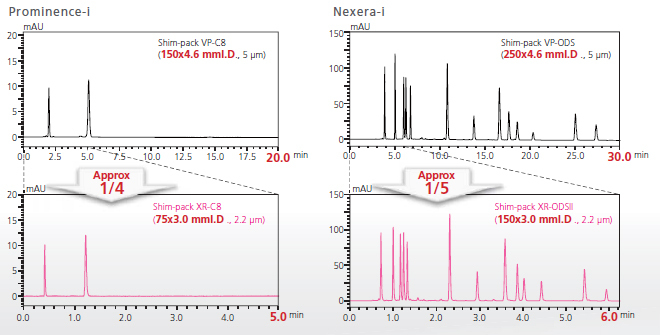 The following examples show a method for analyzing bepotastine besilate used in a high-speed application with Prominence-i, and a simultaneous analysis method for cephem antibiotic in a high-speed, high-separation application with Nexera-i.